Why is my print dark? Why are the colors off? I believe we all found ourselves asking these questions inside our head (or worse, yelling at our photo printer!) during our first steps into our journey in photography. Monitor calibration is the solution, bad settings and bad color reproduction by the monitor are the culprit. Grab a cup of coffee or your favorite energy drink and read on, I'll tell you everything about it, what you have to do, what you gain, how it's done, and what you need to correctly calibrate your monitors. Alright, so here we go! Monitor calibration is a process during which our monitor settings are being adjusted properly in order to achieve a true representation of the "image" our computer sends to the monitor. Unless you configure your monitor correctly, you're not seeing things as they are meant to be displayed! By monitor settings, we're not just talking about the basics (Brightness, Contrast, Color Temperature), nor exclusively about the settings exposed to us by our monitor's OSD (On Screen Display, a.k.a. menu) and perhaps the hidden "Service Menu." We're also adjusting things via software on a software "layer." Think of it as telling the GPU (Graphics Processing Unit), the part of your computer that is in charge of sending the data to be displayed to your monitor, "Hey graphics card, my monitor doesn't show light blue properly, it's off by X amount of red, tell it to show light blue corrected by compensating with X amount of red." 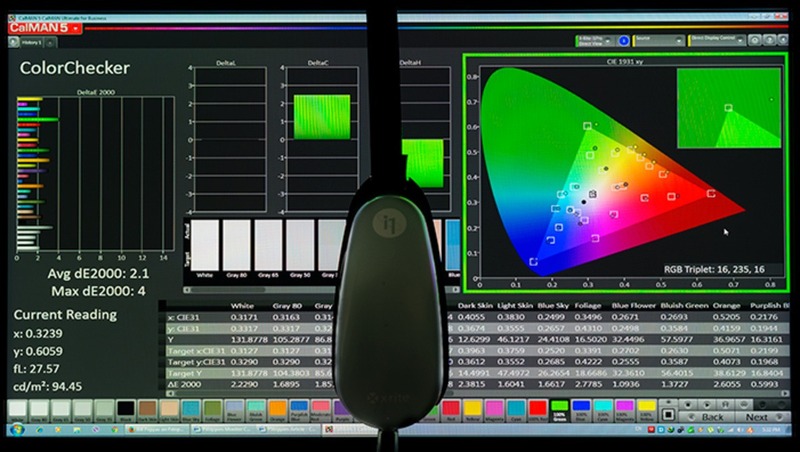 Calibrating your monitor is also correcting the Gamma Curve, expanding the color gamut, and enhancing color reproduction, something we tech geeks call "software LUT." Hope I didn't confuse you already, I'm doing my best to keep things simple and understandable without requiring more than basic technical knowledge/terminology. What do you get out of calibrating your monitor ? You get to see the exposure and colors as they are and not as your monitor used to think they are. You get to send your photos to any printing company out there, and never get them back looking under or over exposed, the colors will be very close to what you saw on your monitor, etc (proper printing requires that you use a printer and paper ICC profile, good printing companies provide you with those). You know your photos are post-processed properly, your colors are accurate, everyone with a calibrated monitor will get to see the same image as you did when editing it. No more flat looking photos, no under or over-exposed photos, you see the shadow and highlight details as they are, not darker or brighter making you adjust them while you shouldn't. The benefits don't stop there, with a calibrated monitor your movies and TV shows will look their best, you'll be seeing what the producers wanted you to see, the skin tones will finally look natural. With the manufacturer pre-defined settings being, well terrible, calibrating it will get your monitor's power consumption to drop, and your monitor's lifespan will expand. It will live longer because the LED or CCFL lamp is now operating at a lower setting and not at its maximum setting, its lifespan will generally live longer and so will your monitor as a result!. Take a look at the photos in the gallery below to see how much of a difference monitor calibration can do. In this case I'm showing you a few photos on a cheap Dell monitor with an IPS panel and W-LED backlight using the 6500K Color Temp Preset (stock, not calibrated) and calibrated. How far off can a monitor be at its stock settings or the settings you dialed in using your "eyes" as a calibration device? From 15% to 500%. Some monitors come with a reasonable settings preset, others with terrible presets. In general, with a very few exceptions, all stock monitors will show your images over-exposed and the colors will be clearly off (you can tell just by looking at a photo of yours for less than a second). To calibrate your monitor you need some sort of equipment that captures and analyzes what your display shows and the appropriate software applications. There are two kinds of calibration devices, colorimeters and spectroradiometers. Without going into technical details and several blocks of text, let's just say that unless the colorimeter comes with your monitor (inside the package, calibrated by the monitor's manufacturer), it isn't accurate enough to get your colors right or near right (if you are interested in a deeply technical article about it, let me know in the comments). You can get the brightness of your monitor calibrated properly, but the colors will still be off, not as off as prior to the calibration process, but not even remotely close to what your monitor can achieve if calibrated with a high precision instrument like a spectroradiometer. A brand new decent spectroradiometer will set you back about $1,200, I suggest the X-rite i1Basic Pro 2. There are even more accurate spectroradiometers, expensive and big lab equipment like the CS-2000A by Kodak-Minolta (about $34,000), although the X-rite is more than accurate enough to get the absolute quality your monitor is capable of producing. Otherwise, you can hire a professional calibrator to do the calibration for you ($75-$150). The calibration process using for example the bundled i1Profiler application from X-rite is pretty straightforward. You warm up your monitor for 30-45 minutes prior to the calibration process, launch the i1Profiler application, hang the spectroradiometer over your monitor, pick your preset (Photography) and click next and follow the 2 step process with the instructions displayed on your monitor. In the end you are given an ICC profile for your setup (unique monitor, monitor settings and graphics card setup dependent). I say unique monitor, because even if you and I have the same monitor model, our panels and LED (backlight) will not have the exact behavior. The settings and ICC profile that work fine for my monitor WILL NOT WORK for your monitor. Using my settings might get you closer to real color and exposure than the monitor's defaults, sometimes though, it might make things worse. I'm not saying this to make you spend money on equipment or hiring a professional, I'm not affiliated to any calibration hardware/software manufacturer, nor friends with a calibrator. I will soon be releasing a video showing you exactly why you need your own settings and others settings won't work. To get the very best, you usually have to make some manual tweaks (manually adjust the black and white levels to prevent any of the primary colors from crashing, see if your monitor suffers from gamut reduction when using low levels of backlight, tweak the grayscale, color temp, etc). That's tweaking the monitor to go from about 98% to 100% of its capabilities. The calibration process should be done under the viewing conditions that you work under when post-processing. Changing ambient light conditions and temperature changes the way our eyes perceive the displayed colors and exposure. Ideally, you should be viewing and working on your photos under zero artificial lighting, just the light that comes out of your monitor. No window light or room lamps, desk lamps, etc. If you can't, at least make sure your room is dim, and don't have any source of light shining directly upon your monitor or within your sight. 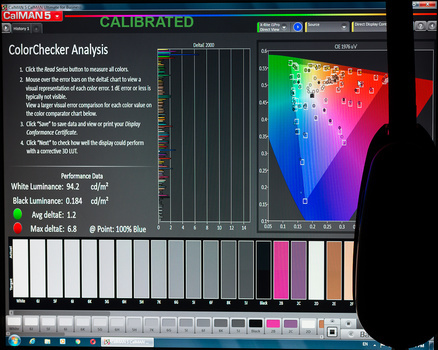 After calibrating your monitor, you can use the ColorChecker feature of SpectraCal's CalMAN Ultimate application to check your monitor's color accuracy for a decent variety of color tones. 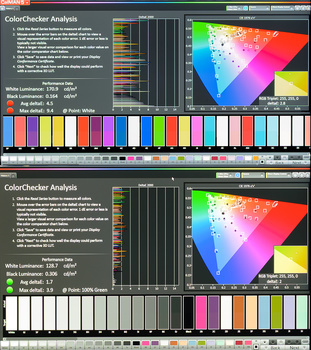 In the photos below you can see the results of the ColorChecker workflow with two cheap monitors in stock and then in calibrated settings. You can see the difference calibration makes both in numbers (deltaE and the horizontal bars in the chart, shorter bars equals better color accuracy) and also see specific color differences using the bars in the bottom of the screen, the bottom half displays the color that is sent to the monitor while the upper half the color that was displayed (wrongfully) by the monitor. The lower the deltaE number (dE) the more accurate your color reproduction is. Under 2 you've got decent accuracy, under 1 you've got near perfect color accuracy. Generally from a dE of 3 and higher you have severe color inaccuracies, you can see the difference clearly without paying attention. A very good monitor can achieve average dE's of 0.3 to 0.5 with the max dE under 1. A decent monitor will give you an average dE around 0.8 - 1.2, max around dE 2-3. An average/ good monitor will give you an average dE around 1.3 - 1.8, max around dE 6-7. Assuming that you, or the professional you hired to do the calibration for you, have the appropriate knowledge, experience, and a precision spectroradiometer, the limiting factor will be your monitor. The monitor's capabilities will set the "ballpark" in terms of the color accuracy you'll achieve. There's also another factor, aging. As your monitor ages, its performance will drop. You don't need to go crazy over this, but a pretty solid monitor will still be pretty solid after 4-6 years of good use. Chances are, by the time your monitor's performance drops significantly, you'll already be tempted to get a newer model. Since every new generation of monitors expands their horizons, we now have monitors capable of producing very wide color gamuts, more accurate color reproduction, and more. What should you be looking for when buying a monitor for graphics work ? 100% or near 100% coverage of your target color gamut (sRGB for photography on the web, AdobeRGB or ProPhoto RGB for prints, Rec. 2020 for 4k video material post-production). A panel type that is known for good color reproduction like IPS (In-Plane Switching), VA as a second choice. TN panels should be avoided unless you have a very very low budget. Apart from the monitor, your viewing conditions matter a whole lot. Just like I said before, try to work in a dark room (yes, we're back to the film days in the dark chambers!) or if a completely dark room is impossible, at least under dim lighting conditions. Better than average color accuracy but pretty bright out of the box, drop the brightness from the default 75 to about 35 and you should be pretty close to the calibration standard 120cm2. Calibrate it with a spectroradiometer and you'll get an average dE around 1 with the max under 5. Despite being more expensive than the U2414H, its default performance isn't blowing it away, in fact, its maximum dE is higher than the U2414H's. This one also comes very bright out of the box, drop the brightness setting to ~30 to get it close to the calibration standard 120cdm2. Once calibrated the U2415 however does wonders achieving performance numbers belonging to more expensive monitors. The average dE is under 1.2, while the maximum stays under dE 3. Leaning towards the pricier monitor choices, the NEC P232W covers the sRGB color gamut almost flawlessly, and goes beyond the sRGB limits in some cases (blues and greens mainly). Ironically, Out of the box performance is worse than the $260 Dell U2415. In the high bright setting it is... brighter than recommended, and in the sRGB color space profile it is less bright than it should be (around 80cdm/2 instead of 120cdm/2). Once calibrated the average dE stays below 0.8, while the max dE stays under 1.5! 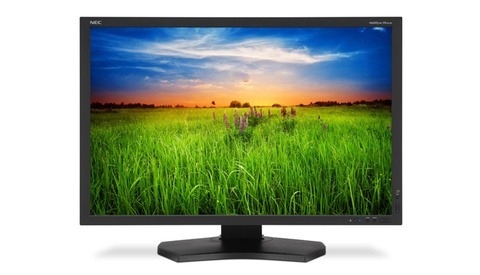 An even more expensive monitor choice is Eizo's FlexScan series 27" monitor, the EV2736WFS. Its out of the box performance is very disappointing, terrible even. Once calibrated however, this monitor shines. It reaches an average dE of 0.3-0.4 and the maximum dE stays under 0.6. Brilliant! I believe we covered a few budget ranges already, if you have questions or a different budget range leave a comment and I will do my best to get back to you ASAP! That's it for now, I shall be back with more technical articles soon, keep Fstopping ladies and gentlemen! Bill Peppas is a passionate landscape photographer with a background in computer hardware engineering. His technical background in electronics allows him to get the best out of any kind of equipment he chooses to use or mod. Theoretically the CS270 SHOULD achieve better color accuracy than the 2736WFS. Practically I can't tell you because there's no review of the CS270, I personally haven't had the chance to measure one. It will be better than the 2736WFS, but how much ? Enough to warrant the price difference ? Maybe, maybe not. If the cash ain't an issue, go for the CS270. Otherwise you'll be more than fine with 2736W. No matter which of the two you'll buy, you'll need to have it calibrated. Both will be very precise once calibrated. I just bought a nice wide gamut 24" NEC monitor, a question came to mind. Is there any difference in performance when comparing calibration devices? I own a color monkey, but there's spider, spectraview etc etc. There are differences between colorimeters like the Spyder, Hueye Pro, SpectraView, ColorMunki Display ( the ColorMunki Design and ColorMunki Photo are spectrophotometers not colorimeters, they are far more accurate than the CM Display ). It's nothing groundbreaking though, it's not like the Spyder 3 vs Spyder 5 for example, we're talking about relatively slight improvements in the measurement accuracy ( max 15% ). I wouldn't upgrade from a colorimeter to another colorimeter. An upgrade to a spectro is what one might call reasonable, from colorimeter to colorimeter is like going from a D5300 to a D5500 ( not worth it, and not a real upgrade by any means ). Great article, but this has kinda left me sad. I'm an amateur but I've been trying to become confident in Lightroom, and just realized today my work may be kinda pointless without calibrating my monitor. After some googling and doing reviews, I was under the impression that X-Rite ColorMunki Display or Smile would be sufficient. However, after reading your reply to Spy Black, I'm a little confused. I'm using a 5 year old LG E2360V-PN and I have about ~150usd to spare. Would I be better off getting the ColorMunki Display or taking my monitor to a professional to do a one-time calibration (I realize that viewing conditions in their lab would differ than in my room, and that I may need to recalibrate after some amount of time?). With 150 to spare I would call a professional to calibrate my monitor ( they will come to your place ). You'll be fine with that, and re-calibration isn't really needed for at least 24 months ( monitors components do not degrade that fast, everybody likes to make more money, but I don't do so by fooling people and lying to them ). The other option, is to hold on, save money every month, until you get your budget to the 300-450$ figure, so you can buy a spectro off ebay for yourself. Your best option is the i1pro. You can find it under different brandings ( the same device, size, style, just different logo on it ), X-rite, EFI, GretagMacBeth. There are more up there, one goes more appear online soon. JUST MAKE SURE YOU GET THE MATCHING CALIBRATION PLATE ( THE PLASTIC WITH THE WHITE TILE ) WITH THE ONE YOU BUY. The auctions showing just the spectro ARE NOT GOOD, you can't get accurate calibration with them because you don't have the matching reference calibration plate. This is a very good article. I found a lot of useful things in here. I do have a fundamental question about calibrating and I was looking through the comments and saw some people (one with an FS next to his face) kind of ask this......If I calibrate my monitor and make it view images "correctly" BUT.....99.9% of the world viewing my images online (or more so video which is the real question here) on NON-Calibrated, OVER-exposed monitors....would they not see the true image and possibly see something bad? and isn't this the case for 99.9% of the images consumed online? In other words....if MOST of my work was going to print, then calibrating is a no brainer, since the print is going to display to the world the correct colors. BUT....if MOST of my work is going and being viewed ONLINE.....where MOST of the world viewing and seeing it wrong.....then would it not be better to color correct on a NON-calbirated monitor since that is what the rest of the world is going to be seeing? obviously that sounds silly, but its kind of the same logic for calibrating for print, you calibrate to the finished medium right? the web's version of this is......bad calibration. IE. if I calibrate My monitor at home (which I did using a Spyder PRO) my Monitor looks NOTICEABLY warmer and the images on it are way warmer then when viewing on a non-calibrated monitor.....so then on the NON-calibrated monitor, my images look super cold and whites are almost blue-ish...it looks bad....which is what the world is seeing (since they don't use calibrated monitors) so would they not think my color correcting is bad??? And does all of this apply the same for video since that will NEVER go to a print option? In the end I obviously stuck with my CALIBRATED monitor...because you know....people keep saying I "Should" but I also keep a non-calibrated one nearby and use it to spot check, thinking MOST of the world is going to see it this way. I agree with you....it would be GREAT if monitors actually came CALIBRATED from the manufacturers! The main issue is that even non-calibrated monitors differ. Some monitors come out of the box with a cold tint ( blue ), others with warm ( reddish tint ). Some people fiddle with their monitor settings, making things even worse sometimes. Calibrated yourself or not, you can't tell what every person out there will be seeing. Each monitor has its inadequacies and intricacies. For example, when a monitor is pretty bad in terms of settings & color accuracy, the reds might be colder than they should, and the blues might be warmer instead ( there's no general rule that if a monitor is overall cold that every single tone will be cold/colder than it should be ). The best you can do is have yours calibrated and "expect the unexpected" from the mass. 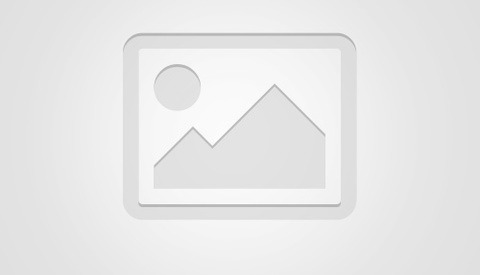 You might join a professional photo contest one day. You might join a contest here on Fstoppers. It's better to have your photos captured & edited properly, than having them "adrift". You don't want to lose a contest for example simply because a judge will find your white balance way off, or your exposure is wrong due to the non-calibrated monitor. Yesterday I was at a client calibrating his gear. He had several PCs & monitors of different brands & models. Some of them where too bright, some where a little brighter than they should and some were darker than they should. Your photo, my photo, no matter what we can do, would look different on any of his monitors. Since the manufacturers are greedy lazy... people, the best thing we can do is spread the word out about calibration, or at least tell & show people how to set their "brightness" and "contrast" setting ( it doesn't require calibration hardware ) so they can at least be looking at the photos/videos/movies with the correct exposure. Nothing in life comes for free. $300-450 for a used unit off ebay is a very good deal if you ask me. When someone spends more than 1 grand on a single lens, has a pricey camera, pricey filters, unless he has no intentions of printing, commercializing, participating in high level contests, spending a few hundreds ( or a hundred for a hired calibrator ) is pretty reasonable if you ask me. Now if you're on a used D3000 and a 18-55, ok, you don't and wouldn't make sense to spend more money on your monitor than your shooting gear, I won't judge. I do realize how valuable it could be for professional photographers, but I am the person shooting on a Canon XS and a $120 lens, so at this point it is not worth it for me. Great informative article though! That was a very informative article Bill. Well done! Do you have any other 27inch 1440p monitor to recommend with a max price of 600€? I am not a professional photographer nor do I have a calibrator, so out of the box good color accuracy would be more than welcome. Dell U2715H looks good to me, although its specs mention 99% RGB coverage. The 2715H that you mention is a pretty solid monitor. Out of the box, if you switch the Picture Preset to the "Custom Color" preset mode you'll be more than fine. It has pretty decent color accuracy with that setting, and all you've got to do is turn down the brightness setting to 20 and you'll be fine for web & print processing. You might need to go down to 15 brightness if your prints come out a little darker than what you see. The Asus MG278Q is equally good and performs about the same out of the box. The best monitor out of the box at 27" 1440p and under 600€ is more than likely the ViewSonic VP2770-LED with an average dE 1.2 and max 2.4. If you're not going to be calibrating it anytime soon ( or at all ) I would go for the VP2770-LED. It's a stunning OOTB ( out of the box ) monitor. Thank you very much for your detailed reply Bill! The MG278Q has a TN panel which I would like to avoid. However the VP2770-LED looks like a very good choice if someone doesn't care for input lag time! I think I will choose between this one and the U2515H. Thanks again!